Believing “there is more to a rose than a cabbage on a stick,” Ralph Moore has devoted nearly all his 90 years to raising roses. The “Father of the American Miniature Rose” and a highly decorated rosarian, he has created almost 400 different hybrids. This year he celebrated his 90th birthday and the 60th anniversary of the business he started with $800 during the Depression: Sequoia Nursery in Visalia, California. His catalogue continues to offer rose lovers a remarkable variety of new breeds and rare classics. One of only three American recipients of the most prestigious award for rosarians, the Dean Hole Medal from the Royal National Rose Society of England, Ralph has earned countless gold and silver medals and honors from American, Dutch, Australian, and worldwide rose societies. The publishers of “American Rose” magazine dedicated the January 1997 issue to him and listed each one of the miniatures roses he has bred in order. Despite his accomplishments and awards, Ralph thinks some gardeners place too much emphasis on producing picture-perfect blooms. “Most people want roses that are easy to grow and yield lots of flowers,” he explains. By focusing on strains that are hardy and prolific, he has helped popularize the plant. Yet Ralph holds the highest standards when he develops new breeds. From 10,000 seedlings, he may choose only three to pursue. He has created unusual and distinctive features, such as stripes and striking color combinations. Rose lovers describe him as a “dreamer” and “composer” who communicates his visions in palettes of petals. His “works” bloom in gardens throughout the world. As each creation expresses Ralph’s imagination, he seeks a fitting name. ‘Lady Anne,’ ‘Mona Ruth,’ ‘Eleanor,’ and ‘Kayla’ honor his wife, daughters, and granddaughter. Some flowers bear the names of friends and fellow rose lovers. One of his Sunday School students called a yellow rose a ‘Bit o’ Sunshine,’ and other names suggested themselves. 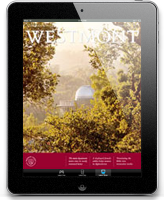 When Ralph’s daughter, Eleanor Bergthold ’60 attended Westmont, he named both a rose and an arborvita ‘Westmont.’ While the rose has become extinct, Ralph sold the patent for the shrub to Monrovia Nurseries and royalties from its sale have helped to create the Ralph & Anne Moore Student Loan Fund. 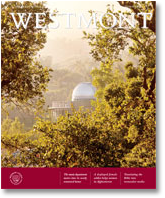 Firmly convinced that private, Christian colleges can raise issues and present perspectives prohibited at state schools, the Moores set up this fund to help upper-division students who need aid to return to Westmont. Proceeds from sales of Blue Skies lilacs, another of Ralph’s creations, continue to support the fund. Ralph is currently developing breeds that will require 10 years to perfect, so his expressions of beauty and excellence will continue blooming well into the next century.